How long will my license be suspended after a hit and run accident in Virginia? If you are facing the loss of your driver’s license after a hit-and-run crash, you should know that there is a difference between license suspension and revocation. Suspension means that your license will be given back to you after a period of time; revocation will mean that you must apply for a new license when your sentence is over. Property damage only. If you struck a vehicle resulting in property damage of over $500, but did not cause injuries, your driver's license can be suspended for up to six months. This is true if you were the driver or a passenger in the vehicle during the hit and run crash. Driver causing injury. If you were a driver who left the scene of an accident that caused injury or death, your driver's license will be suspended for one year. Repeat offenses. If you have been convicted four or more times for street racing or for hit-and-run offenses as a driver or passenger, your license will be revoked (not suspended) for five years. What If I Drive While My License Is Still Suspended? Under Virginia law, driving on a suspended driver’s license is a Class 1 Misdemeanor, which can carry a fine up to $2,500. In addition, Virginia law requires that a judge who convicts an offender for driving on a suspended license must suspend the offender’s license for the same period of time as the original suspension. For instance, if your license is suspended for one year after a hit-and-run conviction and you are found driving, your license must be re-suspended for at least one additional year. Many people don’t think clearly after causing an accident, and panic can quickly turn a misunderstanding into a serious crime. Our legal team can help you build a defense after a hit-and-run charge and fight for minimal sentencing in your case. Call the Easley Law Firm today at (888) 386-3898, or learn more about your options in our free guide, The Criminal Legal Process In Virginia. Can You Be Charged With a Hit and Run for Striking an Unoccupied Vehicle? Could I still be sent to jail even if I had a good reason for violating my probation? No violation. If you have been accused of probation violation, you should consider the terms of your probation carefully to make sure that a violation has taken place. For example, if your probation officer changed the date of your meeting without giving you proper notification, you may be able to convince the judge that you were acting within the bounds of your probation. Accidental violation. Offenders often suffer what is known as a technical violation, where the rules of probation are broken unintentionally. Offenders may mistakenly think that their probation has already ended, or were in an accident and missed a meeting with an officer because they were in the hospital. Reasonable violation. In some cases, offenders may be justified in breaking the rules of their probation. Good reasons for probation violation include a family emergency, personal danger, or another reason that gave the offender little choice but to leave town. Depending on the circumstances, the parole board may choose to extend your probation instead of sending you to jail. How Should I Answer the Charges? As you face the parole board, you will be asked if you admit or deny that you violated your probation. It is vital that you consult with an experienced criminal defense attorney before answering that question. The legal team at the Easley Law Firm can help you determine the next steps to make in your case. Call us today at (888) 386-3898, or learn more about your options in our free guide, The Criminal Legal Process In Virginia. What Happens if I am Put on Probation for a Misdemeanor in Virginia? I honestly didn’t see the cop trying to pull me over. Is this an acceptable defense against an eluding charge? When a driver is accused of eluding the police, it often seems like all hope is lost. After all, it’s his word against the officer’s. Eluding the police is also a serious charge with severe penalties. If convicted, motorists can face license suspension, hefty fines, and even time behind bars. Those who elude police while driving can be charged with a class two misdemeanor or a class four or six felony, depending on the circumstances of the incident. However, the prosecution has to prove that the driver was in fact eluding the police, and must present certain evidence in order to get a conviction. You willfully fled or attempted to elude the police officer. You had a specific intent to evade the officer. The police car exhibited at least one red light visible from the front and sounded the siren when in pursuit of you. You saw the police officer or should have seen the officer. The patrol car lacked a red lamp, siren, logos, insignia, or other characteristics that distinguish it from a civilian vehicle. Having just a red light and siren is not sufficient. You were not intentionally trying to evade the officer. If you were distracted by talking on your phone or to a passenger, or if you were extremely intoxicated, your attorney may be able to prove you lacked the specific intent required to make a conviction. You were too afraid to pull over. If you were in an unsafe area, you may have felt it was too dangerous to stop, especially if the police car was unmarked and you weren’t sure if it actually was an officer attempting to pull you over. The Easley Law Firm has helped many motorists in the Fairfax area with their cases and wants to do the same for you. Contact us today to learn more. What are the advantages of agreeing to a plea bargain? You are facing a criminal charge and a potentially lengthy trial. There’s a good chance you will get jail time, costly fines, a lengthy probation, and a black mark on your record. Is there any way to make all of this go away? There may be with a plea bargain. Plea bargaining is the act of negotiating with the prosecution before you go into court. Your attorney or the attorney for the prosecution may offer the plea, and if both sides agree, they will present it to the judge, who can decide if it is acceptable. Most plea bargains involve the defendant admitting guilt in exchange for a lesser charge or less punishment. Lesser charges. Prosecutors often offer lesser charges than what the defendant is facing if they can be guaranteed a guilty plea. Taking a plea bargain deal means the defendant won’t have to go to court and risk receiving a harsher penalty from the judge. Money saved. Some trials can go on for months. Along with court costs, defendants also have to pay lawyers’ fees during these lengthy trials. When both sides agree to a plea bargain, the matter is settled quickly, which saves the defendant time and money. A better-looking record. Accepting a plea bargain typically results in lesser charges, which looks better on a record than the charges you may receive if you go to trial. This may help you with gaining employment in the future, and if you happen to get in trouble with the law again. The Easley Law Firm wants to discuss your situation with you and help you decide if a plea bargain is right for you. We have helped many defendants in the Fairfax area with their cases, and may be able to do the same for you. Is Representing Yourself in Court a Good Idea? What can I do to reduce the chances of getting pulled over on St. Patrick’s Day for a DUI? From Kegs-and-Eggs to green beer, restaurants and bars all over Fairfax and Northern Virginia are offering fun ways to celebrate St. Patrick’s Day from breakfast to midnight. Known for its drinking, this holiday is a favorite among those, Irish or not, who like to chow down on corned beef and cabbage and guzzle their favorite beer. The problem with doing all that celebrating, however, is that it puts drunk drivers on the road. The police are well aware of this and double their efforts to stop it on St. Patrick’s Day. This puts you in great danger of being pulled over and charged with DUI if you have been drinking and decide to get behind the wheel. Party at home. Invite a few friends over and have them spend the night. This allows you to have as much fun as you want without putting yourself or anyone else in jeopardy. Area stores and grocery markets will be well-stocked with Irish treats to pump up the party. Don’t drink. As crazy as it may sound, enjoying yourself on St. Patrick’s Day is possible without involving alcohol. Enjoy some of the best Irish cuisine around or act as the designated driver for your friends. Who knows? This could be the best St. Patrick’s Day you’ve had, as you likely won’t feel terrible with a hangover the next day. Don’t drive. If you must go out and drink, call a cab or a designated driver. In fact, Washington Regional Alcohol Program will be offering SoberRide, a free taxi service for Washington-area residents from 4:00 pm March 17 through 4:00 am March 18. Put this number in your phone to be prepared: 1-800-200-TAXI. 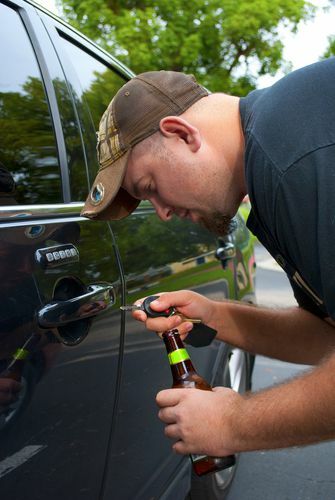 If you have been issued a DUI, the Easley Law Firm wants to help. We may be able to have the charges reduced or even dropped. Contact us today to find out how. How do I know who the “right” criminal defense attorney is? When you find yourself in trouble with the law, you need the help of a skilled criminal defense attorney. Unless you’ve hired one before, you may not know what to look for. Not all lawyers are the same, and some have skills on their side that can benefit you. How Can You Tell If You Have Found Your Attorney? An attorney who has trial experience. You likely wouldn’t hire a doctor who has never performed surgery before to operate on you. Why would you want to hire an attorney who has never been to trial to defend you? You can be sure the prosecution will have a skilled and experienced attorney coming after you, so you want to make sure your attorney is well-equipped to handle the job. If not, you could end up losing and getting an undesirable outcome. An attorney who makes time for you. One of the advantages of hiring a private attorney is having him at your disposal. If he doesn’t call you back or find a chance to meet with you within a short time period, he likely doesn’t have enough time to give you all the help you will require with your case. Look for a lawyer who makes your needs a top priority. An attorney who is respectful. The lawyer you hire should never speak down to you, act rudely, or seem like he’s doing you a favor. You are paying for his services, which means he works for you, not the other way around. If your attorney doesn’t make you feel comfortable right from the start, things likely won’t get better and it is time to find someone else. The Easley Law Firm takes pride in providing the people of Fairfax with the knowledge and experience they need to win their case. Contact us today to learn how we may be able to help you. The state of Virginia requires motorists to provide proof of United States citizenship or legal residence in order to obtain a drivers’ license or identification card. The Commonwealth is like most states in the country that demand such proof before it will issues a license. In fact, only New Mexico and Washington award licenses without Social Security numbers or proof of legal presence. However, this doesn’t stop many unlicensed drivers from getting behind the wheel and driving. Along with being unlawful, the act is also dangerous, as many of these motorists aren’t aware of the state’s driving laws, didn’t take the proper tests needed in order to drive, and don’t understand English—making it hard to read road signs. Fines. The first time you are found driving without a license, you face a $1,000 fine. If caught again, the fee is $2,500. Jail time. Those who are charged with a first offense can spend up to six months in jail and 12 months for subsequent offenses. License suspension. Those found guilty can have their licenses suspended for 90 days. Demerit points. Driving without a license also puts three demerit points on your license and will stay on your DMV record for three years, but stays on your record permanently. Deportation. Undocumented immigrants could face deportation if found guilty, particularly if they have a history of criminal activity. People get behind the wheel without licenses for a variety of reasons, including getting to work in order to provide for their families. We understand and want to help. If you are charged with driving without a license, the Easley Law Firm may be able to help. Contact us today to speak with an attorney about your situation and find out what we can try to do for you. What medications can have dangerous interactions with alcohol? Your doctor recently prescribed you a medication and so far, it’s worked well. You’re planning to meet your friends tonight for drinks, and you’re not sure if mixing the two is a good idea. Mixing drugs and alcohol can have dangerous effects. Not only can the two make you feel even more intoxicated and perhaps cause serious health issues like a heart attack, but it can lower the effectiveness of the medication. Antidepressants. Both alcohol and antidepressants can alter the central nervous system, which can affect the brain and impair your thinking skills and alertness. Combining antidepressants and alcohol can cause sleepiness, and can also decrease a person’s judgment, reaction time, and coordination. Additionally, certain antidepressants can cause a dangerous rise in blood pressure when taken along with alcohol. Diabetes medications. Those patients with diabetes who take medication to treat their condition can feel sick when drinking alcohol. Along with having extremely low blood sugar, diabetes patients may feel dizzy and nauseous, and experience flushing of the face. Blood pressure and heart medications. People taking angiotensin-converting enzyme (ACE) inhibitors can experience blood pressure that becomes too low when drinking alcohol. As a result, they can feel dizzy, light-headed, and even faint. Additionally, alcohol is thought to decrease the effect of beta-blockers, which people often take for the treatment of chest pain, heart failure, and abnormal heart rhythm. Drinking alcohol can make getting behind the wheel or operating any kind of machinery even more dangerous. When you mix alcohol with certain medications it can put you at an even greater risk of becoming seriously injured or injuring somebody else. We encourage you to share this article with your friends and family on Facebook or Google+ to help others better understand the risks associated with taking medication and drinking alcohol. Today, it felt like everyone was out to get you. First, the cashier at the store forgot to give you one of the bags full of your purchases. Then, a waiter knocks a glass of water off of his tray and it lands in your lap—to say you’ve had a bad day is an understatement. You just wanted to get home, pull down the shades, and relax, but driving on Interstate 95 was another test on your patience. It seemed like every large truck was on the road at the same time, and driving near these enormous vehicles in your small car is stressful. In order to get away from the 18-wheelers, you switched lanes a few times until you were in the clear, but an officer misconstrued your actions as driving aggressively. You’re facing jail time. Aggressive driving is a Class 2 misdemeanor in Virginia, and that comes with a possible six months in jail. Attempting to prove to a judge yourself that you weren’t breaking the law is risky, and if things don’t go the way you want them to, the result is time behind bars. The fines are more expensive than lawyers’ fees. If money is an issue, consider this: you may have to pay $1,000 in fines, plus court fees if found guilty. A lawyer’s fees are typically less expensive than the fees, and if successful, you won’t have criminal charges on your record for this incident. Along with jail time and fines, you also face points on your license and a possible suspension. If you want to increase your chances of not having these penalties against you, hiring an attorney is your best bet. Contact the Easley Law Firm today to speak with an attorney about your situation and find out what we can do for you.